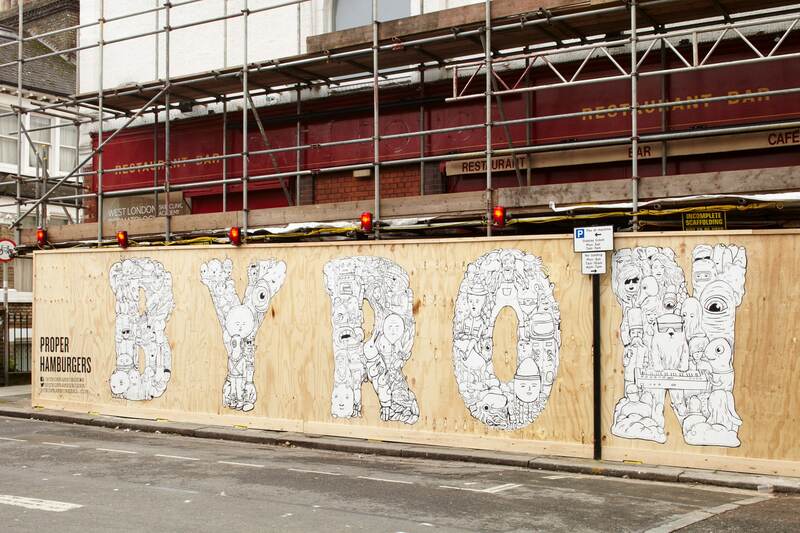 When Byron opens a new restaurant a hoarding is erected whilst building work takes place. These spaces provide the perfect opportunity to spread the Byron message, give locals an insight into what they can expect and create something visually interesting whilst the site is being constructed. 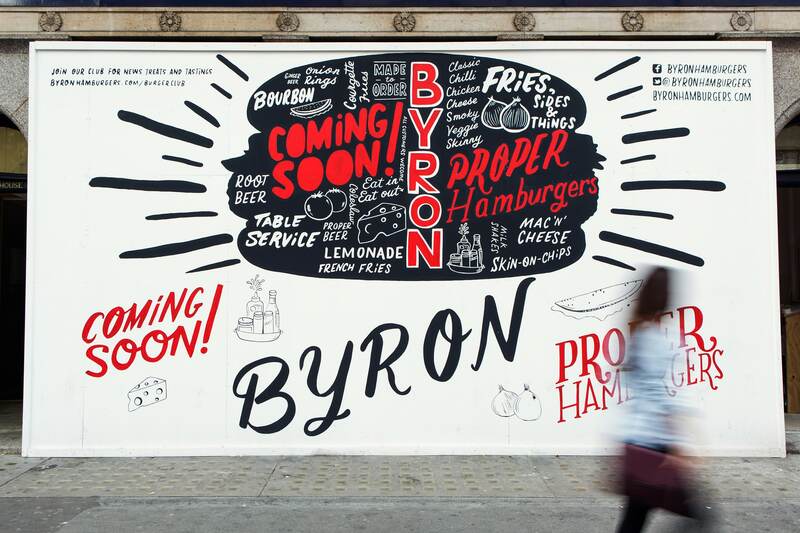 For over five years we worked with Byron on the internal and external signage for all new restaurant openings as well as a number of restaurant refurbishments. As Byron are well known for not having a singular logo or easily described ‘house style’ each restaurant is individually designed. There are no custom typefaces or brand colours, instead we worked closely with the architecture and interior design team to develop each restaurant’s unique look and feel. Each hoarding is approached differently; we consider it’s location, the residents and the size of the hoarding before discussing possible directions for the creative. For many of the hoardings we commission illustrators to create unique artwork. The brief for these is kept intentionally quite loose and we work very collaboratively with the illustrators on initial sketches, feedback and amends, right through to final artwork. At the heart of Byron is doing things properly. This ethos extends through to the realisation of artwork. 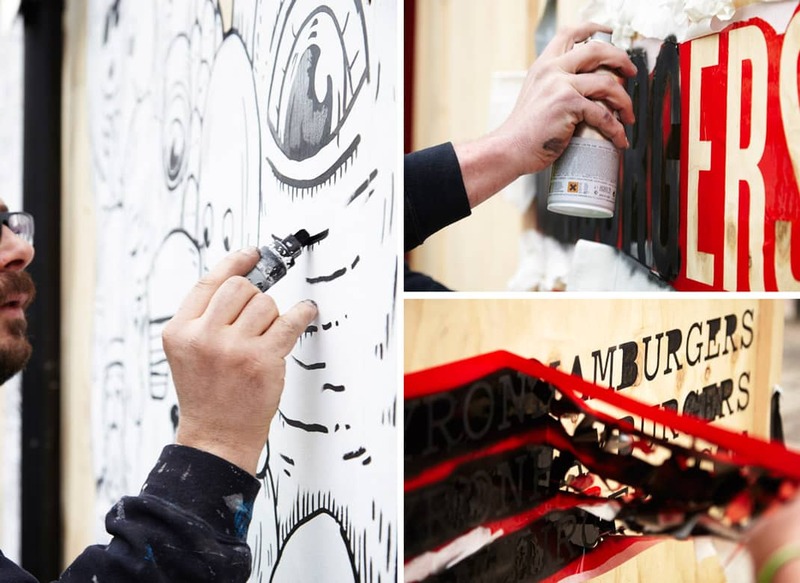 Wherever possible the artwork is hand painted directly onto the hoardings as this keeps the personality of the work and reinforces the authentic effect – something which can be lost when using vinyl. Byron’s Shoreditch restaurant was part of a new building and therefore required very little work to the exterior, however the windows still needed to be covered whilst work to the interiors took place. 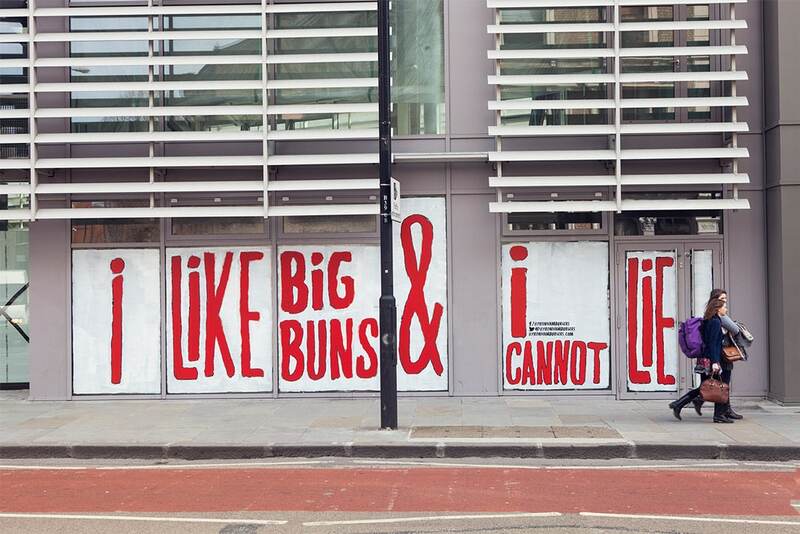 We commissioned the illustrator Jean Jullien to create playful type which could fill the windows and applied this using an adaptation of white washing – a technique commonly used to block out windows. The end result was an eye catching design which reinvented the site and attracted a lot of attention. 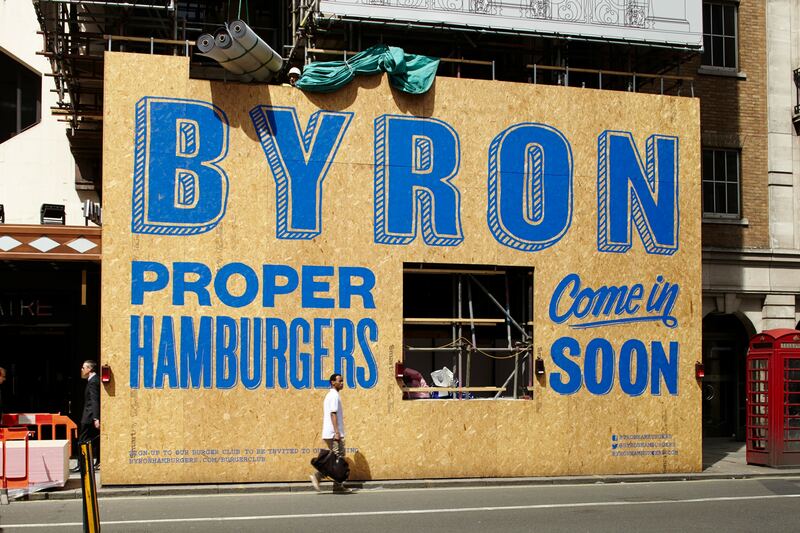 For Byron Old Street we used another technique commonly used to fill hoardings, although normally not by bigger, more established brands. 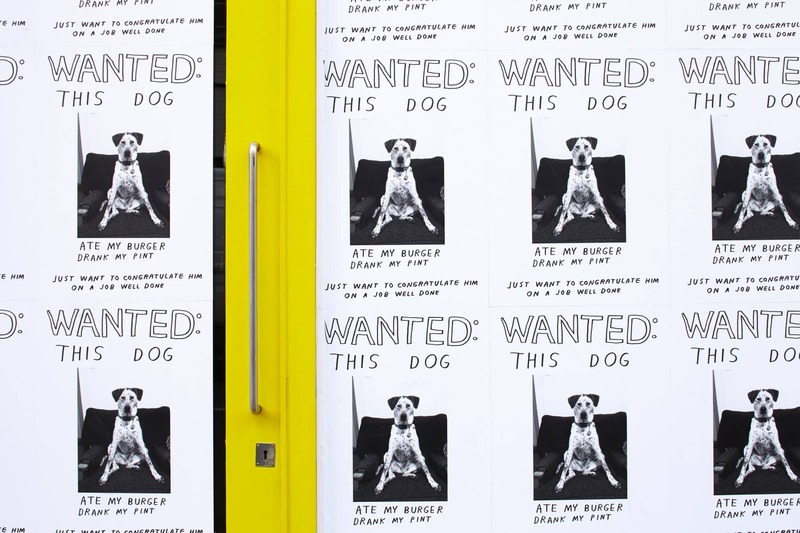 Working closely with the illustrator Nathaniel Russell we created a series of posters which were applied to the windows on consecutive months. Without mentioning Byron the posters implied the connection in a playful way. On all hoardings, once final artwork has been created we spend time considering what medium we want to produce it in. For us the process and execution of a hoarding is key. The devil is in the detail and we work hard with the signage companies to really push both materials and process. Andrew Rae created illustrated letters full of character and with a lot of detail which we decided should applied to raw plywood. We had in depth conversations with the signage company discussing whether we should apply the shape in white and then create a stencil for the black details to be spray painted on top. In testing this, we found that it worked for the type, but not for the large Byron letters, as all the infill areas had to picked of by hand. In the end the large letters were projected on to the board at night, traced and then using this as a guide hand drawn with marker pens.